This page contains links to the pages listing support groups in the United States. It should be presumed that these providers are English-speaking unless otherwise indicated. 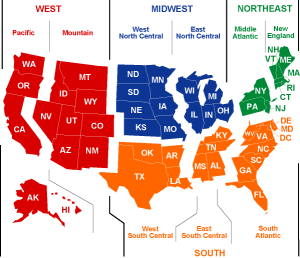 For support groups outside of the United States, see Support groups. For support groups related to SOFFAs or loved ones of Transgender people, see also here. Disclaimer: Listings are for information purposes only and do not constitute recommendations by T-Vox. As this wiki can be updated by third parties, T-Vox cannot be held responsible for the quality of information here. Also, all websites listed here are outside of our control; T-Vox is not responsible for their content. The support groups on the following pages are grouped according to the nine United States Census Divisions. Click the map for a larger image and to find the Division you’re looking for. If you are in or near Chicago, IL: See the TransLife Project, which is new as of summer 2013. The mission of the TransLife Project is to provide a Trans-specific employment support program, fixed and scattered site housing for Transgender persons, and linkage to culturally-competent healthcare and social services. If you are in or near eastern Tennessee, see Transitioning in East Tennessee.